As Joss Whedon‘s latest TV series – Agents of Shield – is premiering in the UK this evening, it felt like time for fact about the God of the Nerds’ early career. they sent me the script and it was a shambles, but the story that Lasseter had come up with was, you know, the toys are alive and they conflict. The concept was gold. It was just right there. And that’s the dream job for a script doctor: a great structure with a script that doesn’t work. A script that’s pretty good? Where you can’t really figure out what’s wrong, because there’s something structural that’s hard to put your finger on? Death. But a good structure that just needs a new body on it is the best. So I was thrilled. I went up to Pixar…and stayed there for weeks and wrote for, I think, four months before it got greenlit, and completely overhauled the script. There was some very basic things in there that stayed in there. The characters were pretty much in place except for the dinosaur, which was mine. I took out a lot of extraneous stuff, including the neighbor giving the kid a bad haircut before he leaves. There was a whole lot of extraneous stuff. …sought a pivotal role for Barbie. As Whedon pictured it, Woody and Buzz, seemingly doomed at Sid’s house, would be rescued by Barbie in a commando style raid. Her character was to be patterned after Linda Hamilton’s portrayal of Sarah Connor in Terminator 2. (The concept of a two-fisted, derriere-kicking heroine, still a novelty at the time, had also featured in Whedon’s script for the 1992 film version of Buffy the Vampire Slayer.) Whedon’s vision came to naught, however, when Mattel refused to license Barbie. It is nonetheless striking how little interviews with and profiles of Whedon mention his work on Toy Story. This is in part because much of the rest of his work is so impressive. But Toy Story is a seminal film that had a huge cultural and commercial impact, and it is doubtful that without Whedon it would have worked. 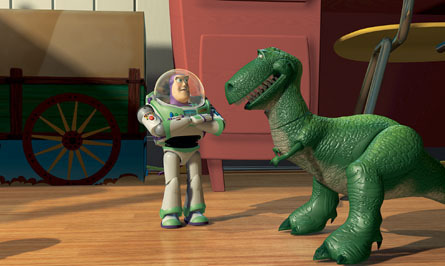 It would certainly have lacked much of its sparkling dialogue and of course Rex. It should still merit a mention when his career is discussed. That it doesn’t is I would suggest a product of our attraction to the idea of creative works as the product of a single great mind. Whedon said of his role “I definitely feel I played a part in “Toy Story,” a substantial one, but it is John Lasseter’s movie.” Because we struggle with the idea that films are team efforts, we tend to lionise a single creator for each work. So Lasseter is given sole credit for Toy Story, and indeed all the people other than Whedon who made the Avengers or Buffy a success are overlooked. I can’t be alone in finding that a shame. Note on sources: The Quotes from Whedon are taken from this interview. Otherwise where I’ve not provided a link the source is David Price’s book. ← Is a Large Finance Sector a “Curse”? Very interesting. I’ll have to catch up on this guy’s work. Just bought Firefly. I suggest reading up on the literature of this theory, both for and against.